Before you even open Facebook, you should have a clear idea of what you want – which particular business objective you’re hoping to achieve, and why Facebook is the best way for you to do it. This isn’t necessarily as simple as it sounds, so if you haven’t already read our overview of Social Media marketing, I recommend you take a moment to do that before going any further. The next thing you need to do is to create a Facebook Page for your business. Importantly, this must be a Page, and NOT a Group or a personal profile, which are not designed for business use and don’t have the full range of functions for promotion and tracking, which may make you look a little unprofessional. The easiest way to create a new Facebook Page for your business is to start from your personal Facebook account. Log in to Facebook in the usual way, click “Pages” in the bar on the left hand side (under your profile picture and lists of Favorites, Groups and Apps) then, on the next page, the “+ Create a Page” button. Next, choose which category will make it easiest for people to find your page, and best represents you. For example, if you have a showroom or other physical address you’d like people to visit, you would probably choose something from the “Local Business or Place” list; whereas if you’re a visiting contractor, an option under “Company, Organisation or Institution” might be better. Enter the business name – in the words your customers would use – and you’re ready to go. A picture: worth a thousand words? Now, you have a chance to choose your business profile picture. Think carefully, as this will be the image that represents your company throughout Facebook, in the same way as your own personal profile image appears every time you post. Bear in mind that the image will be presented as a square, and will often appear in a very small size, so it is good to use something instantly recognisable rather than, for example, some product brochure photography. For this reason, many companies choose to use a square version of their logo; you can see ours on the Golden Coast Facebook Page. You, however, might not have a logo that would be legible in this format, in which case look for something clean, unfussy, and easy to understand at a small size; perhaps a spa jet on a white background or, for maintenance contractors, the head of a spanner. If you do have a larger or more atmospheric photo, there is the option to include it at the top of your Facebook Page, as a cover photo. If the picture is good, this can be a great way to make your Page instantly eye catching and attractive, while hopefully making a point about your company, for example by reflecting quality or service. You can even change this image on a regular basis, to keep things looking fresh. Uploading and manipulating your cover photo is easy to do: simply click “Add a Cover” to the right of your profile picture, and follow the step-by-step instructions on screen. Next, write a few words describing your business. Again, it is important to use language your customers and contacts would actually use. Think: if you were your own average customer, what words and phrases would you type into Google, or Facebook’s search box? Keep this information simple and to the point; it is what people will see when they first arrive at your Facebook Page, so don’t overwhelm them. Instead, make it very easy to understand who you are and what you do, so your visitors will know immediately that they have come to the right page, and get a flavour for why they should do business with you. If you’d like to add more detail, you have an opportunity to do so later, by using the “Edit Page” option, under the “Manage” drop down menu at the top of the page. Click on “Basic Information”, and you can add a more detailed description, foundation date, mission statement… even any awards you’ve won. Fill in the boxes, and the information will appear on your Page under “about”; if there are any sections you don’t want to include, simply leave the boxes blank. 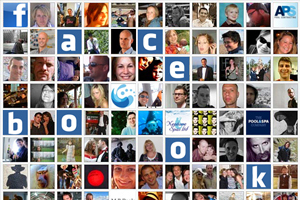 You now have an active Facebook Page, ready to share content and welcome your first visitors. Even now, this is very much a blank canvas. What you’ll want to talk about and who you’ll want to invite to read and interact will of course come down to the questions you asked yourself at the beginning of this article, and the plans you have for your Page. To help, Facebook will prompt you in some of the more common areas, such as how to invite your own Facebook friends to “Like” the page and so become part its online community of users. Similarly, if you have a list of business email contacts – whether using an online service like Hotmail, or an offline tool like Microsoft Office Express – Facebook gives you the opportunity to contact up to 5,000 at a time, direct from a link on your page. Again, there is a prompt for this once your page is active; if it suits your plan, simply follow the instructions. In future articles, we will discuss potential business uses for Facebook in more detail. In the meantime, though, your page can be a valuable tool for building strong relationships with customers, contacts and prospects alike. Start a conversation, and enjoy.